Davoudi Etched Champ in Vegas! 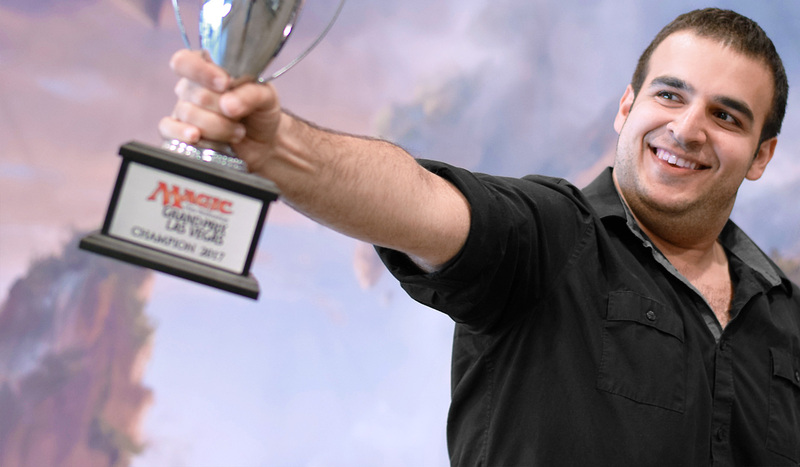 On a mulligan to four cards, Mani Davoudi followed his 9-0 Day 1 with a trophy Day 2, defeating Theau Mery to become the final GP Vegas weekend champion. Oh my word, what a weekend! And what a way to end it. In many ways Davoudi's triumphant final game—where he eked out a victory from a four-card hand—describes how we all feel right now. We were low on gas, and had to use every ounce of strength to finish the marathon weekend in Las Vegas—but in the end, we were rewarded with a giant prize. Here at Grand Prix Vegas, people have become part of Magichistory. There were three different Grands Prix, a zillion different side events, art galleries, Hour of Devastationpreview cards, panels, games ... it was a veritable Magicconvention! But now, just like Davoudi's shaking hand hoisting the trophy, we're in need of some well-deserved rest. So from everyone in Vegas, get some sleep! Because there's more Magicnext weekend. A third day of Grand Prix play has drawn to a close. Two triumphant competitors have hoisted the Legacy and Limited trophies high, and only a single trophy remains un-awarded. Today, 3,264 Modern competitors made their best run at gaining the final Top 8, their decks representing both new favorites and classic Modern staples. At the end of nine rounds, only twelve players' perfect records remained intact. Robert Smith, Mason Linne, Mani Davoudi, Hannu Vallin, Jody Keith, Daniel Wong, Kevin Kingsley, Chloe Beadell, Theau Mery, Craig Wescoe, Sam Rolph, Owen Turtenwald, and Brian Braun-Duin lead tomorrow's field in pursuit of the third Grand Prix title of GP Vegas 2017.Join us here, and at twitch.tv/magic, to see the conclusion of this historic Grand Prix!